Home » Blog » Posts » Time flies when you are having fun! 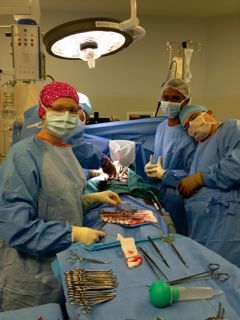 This post is by Julie Hulston, Cardiac Theatre Nurse – Fiji. Firstly, whoever said the famous quote “there’s no i in team” was very smart. I have over the last few days (& nearly a week now!) witnessed a wonderful display of teamwork across all specialities which makes me feel so proud & pleased to be a part of this wonderful cause of Open Heart International. For those readers who know more or less what we get up to and aware of our challenging environment be it just the heat, the language or the lack of fully functioning professional resources, you will know that “occasionally” we have to “take back” our patients to the operating theatre & investigate unplanned occurrences. This equals an even later day or night (or morning! ), cold Indian eaten from a takeaway container back at the hotel, and increased fatigue as we have to get up & do it all again the next day. It brings a whole new meaning of the term “redo”. Its not just the actual surgery, its all the “washing up” and sterlisation of our instruments and setup for the next day we need to do in the early hours of the morning! 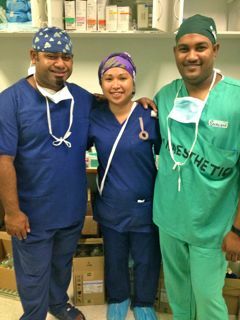 With the pressure of a full days surgery there is no waiting or down time to compensate for the emergency call in, it must be done so we can continue to help as many of our beautiful and grateful Fijian patients as possible. Thank goodness for our Alowesi, now affectionately called “Page 1 & 3” after her photo and story were in the Fiji papers yesterday, who is more than happy at the sink, cleaning the instruments and preparing them for the steriliser. She describes herself as “the latest model dishwasher from Randwick”! This year in theatre we have the help of Batai, Mila, Nate & Sera who are working hard, asking questions & looking on in awe at the skills of our surgeons & nurses & the fascination of a beating heart. 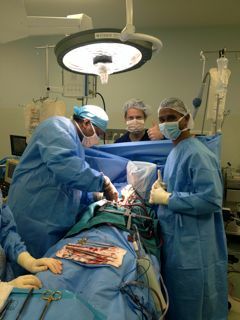 As we all know, it sure beats doing your average appendix! 15 adult surgeries have been performed in 4 days, & I think Gillean our new recruit to the OHI anaesthetic team has finally taken a breath, got the storeroom organised & is on top of things, she’s doing a great job looking after our anaesthetists especially as not only is she new she’s flying solo with just the assistance of the locals. Thanks though must go to Kelvin & Helen who pitched in early & again worked as a team to get us up & running. Perfusion are always the quiet achievers & have made all sorts of plastic bits fit & work to make the necessary & totally essentially bypass machine come together & do what it’s gotta do! I am sure the steady slow infusion of chocolate is also helping! ‘Til next time thank you as always to our family, friends & general supporters of our cause. We couldn’t do it without you and we really are missing you even if we haven’t had a chance to say that yet!